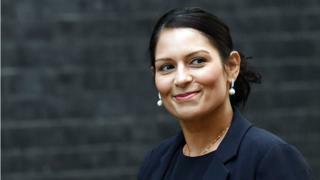 The International Development Secretary held undisclosed meetings in Israel without telling the Foreign Office while accompanied by a powerful pro-Israeli Conservative lobbyist, the BBC has learned.Priti Patel met the leader of one of Israel's main political parties and made visits to several organisations where official departmental business was reportedly discussed. According to one source, at least one of the meetings was held at the suggestion of the Israeli ambassador to London. In contrast, British diplomats in Israel were not informed about Ms Patel's plans.Ministers are by convention supposed to tell the Foreign Office when they are conducting official business overseas. The meetings took place over two days in August while Ms Patel was on holiday in Israel. No civil servants were present but Ms Patel was accompanied by Lord Polak, honorary president of Conservative Friends of Israel (CFI), an influential lobbying organisation that has access to wealthy party donors. Some ministers and MPs accused Ms Patel of trying to win favour with wealthy pro-Israeli Conservative donors who could fund a potential future leadership campaign.Others accused her of conducting her own "freelance foreign policy" on Israel. Ms Patel is a long-standing supporter of Israel and a former vice-chairman of CFI. Ministers also said there was a potential risk that the meetings could have broken the ministerial code of conduct which states that "ministers must ensure that no conflict arises, or could reasonably be perceived to arise, between their public duties and their private interests, financial or otherwise". One minister said: "This is outrageous. She is a Cabinet minister. She just cannot do this. This is about donors and influence. "One former minister said: "What does it say to the rest of the Middle East if a senior Cabinet minister in charge of Britain's huge aid budget disappears for 48 hours from a family holiday in Israel and is under the wing of a pro-Israeli lobbyistThe revelations risk embarrassing the government while the Israeli Prime Minister, Benjamin Netanyahu, is in London to mark the centenary of the Balfour Declaration, when Britain first gave its support for a national home for the Jewish people.A senior Downing Street source denied Ms Patel had done anything wrong. And a source at the Department for International Development said it was a private holiday paid for by the Secretary of State herself. Foreign Office sources in London - and diplomatic sources in the region - confirmed that Ms Patel had not given them any warning of her visit. One minister said: "Yes, we did not know about the trip. We were unsighted on it." Another source said the British consulate in Jerusalem was "blindsided" and felt "slightly bruised".A third Foreign Office source said: "We didn't know and would have expected to know, given the meetings she had. "Ms Patel took time out from her family holiday on 24 August to meet Yair Lapid, the leader of Israel's centrist Yesh Atid party, a former finance minister in Mr Netanyahu's coalition government. Mr Lapid tweeted a picture of the meeting, saying it was "great to meet Priti Patel" whom he described as "a true friend of Israel." Mr Lapid's spokesman confirmed that he had met Ms Patel but refused to say what they discussed. Ms Patel was accompanied by the Tory peer, Lord Polak. He is now honorary president of Conservative Friends of Israel but for more than 25 years, he was the director of the lobby group. And in that role he had a huge influence on Conservative thinking on the Middle East, including writing speeches for Tory party leaders.Lord Polak told the BBC that he just happened to be on holiday at the same time as Ms Patel. "We met up for one or two things," he said. "It was the summer holidays. I just joined her for a couple of days, some drinks, some dinner, that kind of thing. "That included the meeting with Mr Lapid: "He is just an old friend of mine, a personal friend. He is more a journalist than a politician. We just had coffee with him. It wasn't anything formal. It is all very innocent." Conservative Friends of Israel regularly pays for MPs and peers to visit Israel. But Lord Polak said that Ms Patel paid for the holiday herself and the trip had nothing to do with CFI. The peer said he organised for Ms Patel to visit Israeli firms and charities creating technologies that could be interesting to a Secretary of State for Development. Ms Patel visited Beit Issie Shapiro (BIS), a leading Israeli disability charity and campaign group, where she reportedly discussed the possibility of her department forming a long-term partnership with the organisation. Jean Judes, executive director of BIS, published a picture on Facebook of Ms Patel visiting her organisation. Mrs Judes wrote: "As the director of the DFID - UK Department for International Development, Ms Patel expressed interest in a long-term relationship with Beit Issie Shapiro, harnessing Israeli innovation to advance assistive technology for the benefit of people with disabilities in underdeveloped countries. "We look forward to a strong, fruitful partnership with the DFID to enhance the quality of life of people with disabilities worldwide." Mrs Judes told the BBC that the Israeli embassy in London had been involved in setting up the visit: "We reached out. "We met with the Israeli ambassador in London and he said this is something we should bring to the attention of Priti Patel." The Israeli embassy in London declined to respond to questions. Lord Polak said Ms Patel also visited Innovation: Africa, an Israeli not-for-profit organisation developing new solar and water technologies for remote African communities.The fear among some Tory MPs is that Ms Patel also used the trip to discuss reducing her department's support for Palestinian groups. The UK currently sends about ?68m a year to support the Palestinian territories, most of it from DFID's budget. Some of the money is given directly to the Palestinian Authority, the rest through the local UN agency or individual groups. Critics claim that instead of just supporting Palestinian refugees and institutions, the money has also been used to pay salaries to Palestinians jailed for terrorism-related offences. Ms Patel has long been a critic of this funding. She tightened up the guidelines on Palestinian spending last year, focusing more on health and education, but one Foreign Office source said that she had recently tried to go further, presenting a paper to the prime minister and the foreign secretary for yet more restrictions on the funding. "But they were not particularly impressed by her arguments," said one Foreign Office source. Another said: "She has been trying this for some time. She has been pushing to get her hands on the PA aid budget and we have been pushing back. "Others suggested Ms Patel was getting close to CFI in preparation for a future leadership contest. One Whitehall source said: "I have always understood it to be part of her leadership ambitions, if she has got people from CFI who are prepared to put money into her. "The BBC sent Ms Patel's office a list of questions concerning the visit to Israel which it declined to answer.